As many of my friends know, I’m a collector. Not the kind you fight in Mass Effect 2, but the kind that takes every chance he gets to find curious things from flea markets and yard sales. Besides the obvious synthesizers, drum machines and synth memorabilia, I collect among other things old videogames and records. The best thing happens when two worlds and collections collide as is the case now. 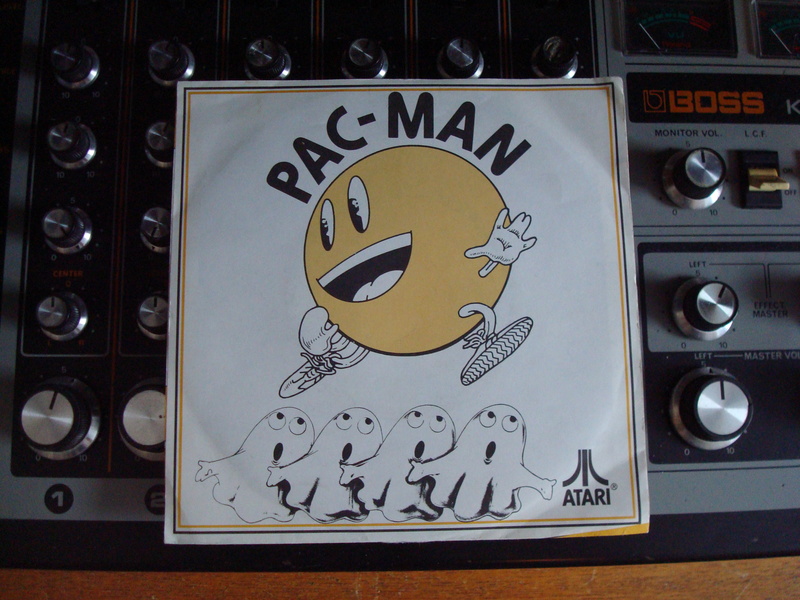 I have a small but well formed collection of videogame-themed records and this 7″ is perhaps the crowning jewel of that collection. 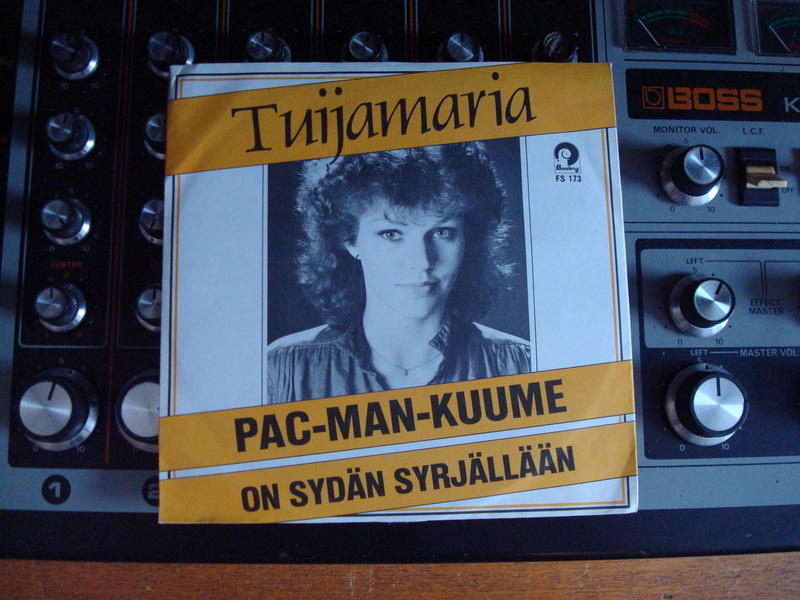 Tuijamaria, who had previously scored a goal with her single Ai-ai-ai-ai-Jussi, teams up with the songwriting skills of American duo Buckner and Garcia and does a cover version of their great early eighties novelty hit Pac Man Fever. Of course Finland’s own Giorgio Sivonen is at the controls and the outcome is psychedelic to say the least. The track starts with sound effects from the original arcade machine and they repeat many times later in the track, but the pulsing synth bass is what really gets the wheels turning. If you’re not fluent in finnish you’re really missing a big part of the weirdness in this song. The lyrics happily confuse VCR:s with game consoles and also mention Dallas and Pamela. Starting from the first pair of sentences “Kun ihan mamot tykkää Tarzanista sekä apinoista, niin on koko meidän jengi saanut kuumeen videoista!” Hahahahaha! Firstly “mamo” is a word I haven’t heard in a long long time. Basically what it says is that Tarzan & his monkeys are for pussies and that their gang is now addicted to their VCR. And it just gets better from there. A lot better. Who ever did the translation should’ve been given a Finlandia-prize, it’s priceless. Oh, and did I mention the cover? For a videogame freak like me the frontside is really classy stuff, beautiful hand drawn rendition of Pac-Man complete with the Atari-logo and no mention of Tuijamaria at all. The backside again is a whole different story. Sit back, kick off the shoes, turn up the volume, press play and get ready to start the weekend. You really can’t go wrong with this. Oh, was that the sound of the mailman bringing me my new sampler? Have to go. great track, great post, great everything – except that fact that there’s no download link. Why? It’s not like you’re not pirating Tuijamaria already, and it would be a great act of culture to release it into the wild in good quality, no? You can find the single from youtube.